Construction crews are still exposed to many dangers at work sites because the measures taken to protect them are insufficient, their work is not properly supervised and they don't receive efficient training, a recent research report found. The report, filed by Beijing Normal University's China Labor Studies Center, surveyed 311 construction workers in the capital. Of them, about a third said work-related injuries or deaths had occurred at construction sites they had worked at in the past 12 months. The majority of those accidents involved falls from high places. In one of the deadliest accidents to occur recently at a construction site, 19 workers in Wuhan, Hubei province, died on Thursday after an elevator they were using plummeted 100 meters to the ground. Attempting to explain why work-related accidents frequently happen at construction sites, the report said the industry has lost some of its appeal to young workers. The young people who do take construction jobs often don't plan to stay for long and thus attach little importance to undergoing work safety training. They also tend to lack experiences that would help them avoid dangers, it said. The report notes that mandatory worker safety training was called for in a regulation introduced by work safety authorities in 1997 but that such training practically exists in name only for construction workers. Only half of the workers surveyed said they had once participated in the training. The report found that they had taken an average of five hours of the courses, far less than the 15 hours that is mandated, it said. As a result of that lack of training, many workers do not recognize the dangers of their work. "I don't think dust and noise are dangerous and, anyways, you just can't avoid them at construction sites," the report quoted a worker as saying. The report said 40 percent of the workers surveyed were worried about the quality of equipment meant to protect them. "Our helmets are very thin and it's easy to break them," the report quoted another worker as saying. It also found that not enough is being done to supervise workers' use of the equipment. About 60 percent of the workers surveyed said they wear helmets, gloves and safety belts every day, 30 percent said they often wear them and 10 percent said they don't wear them at all. Many workers said they think the equipment isn't comfortable and makes it difficult for them to perform their jobs, it said. Construction workers are often overworked and live in shabby and crowded temporary housing. In general, they can expect to put in 10 hours a day in winter and 12 hours a day in summer, usually without breaks on weekends, according to the report. Zhao Wei, who wrote the report, said the construction workers her organization surveyed were migrants who had left their homes in the countryside to work in Beijing. They were between the ages of 18 and 65 and only slight more than half of them had received an education beyond what's offered in junior high school. "We found that only 33 percent of the workers have signed labor contracts with employers and, among them, about 78 percent do not have a copy of that contract in their hands," she said. "Most workers do not even know who their employer is and whether a contract is effective or not." Why are there so few contracts? Zhao said that most workers find jobs through acquaintances and that contractors, in general, try to employ people from their own home villages. The employers and employed in these situations often think they need nothing more than trust to ensure their relationship goes smoothly, she said. But this absence of labor contracts makes it difficult for workers to obtain compensation if they are injured on the job, she said. 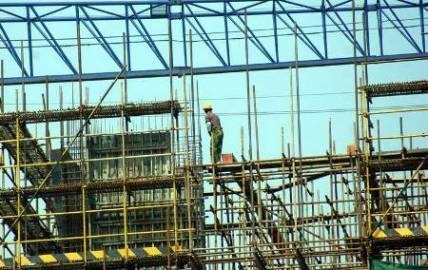 Feng Tongqing, a labor professor at the China Institute of Industrial Relations, said the lack of contracts also results from a poor enforcement of provisions that construction authorities laid out in 2005. Feng said more should be done to regulate labor outsourcing and that project contractors should recognize that it would be easier to manage workers if they left that task to human resource service agencies. "Through the assistance of trade unions, special collective contracts concerning labor protection could be signed between contractors and workers," he said. "The contracts could include clauses that stipulate what sorts of protective equipment will be given to workers, and those workers could just refuse to work if they discovered dangers during their work. "The recent tragedy in Wuhan showed that the workers there had not been trained to know that it is very dangerous to use an elevator that has exceeded its service period," he added. Feng also called for giving labor and safety authorities more power to enforce laws and supervise work conditions.